The change in price over time of any asset provides insight. In periods of quiet accumulation we see less spikes higher and a more steady pace of modest price rises. BTC, ETH, and LTC are all displaying this type of price movement. 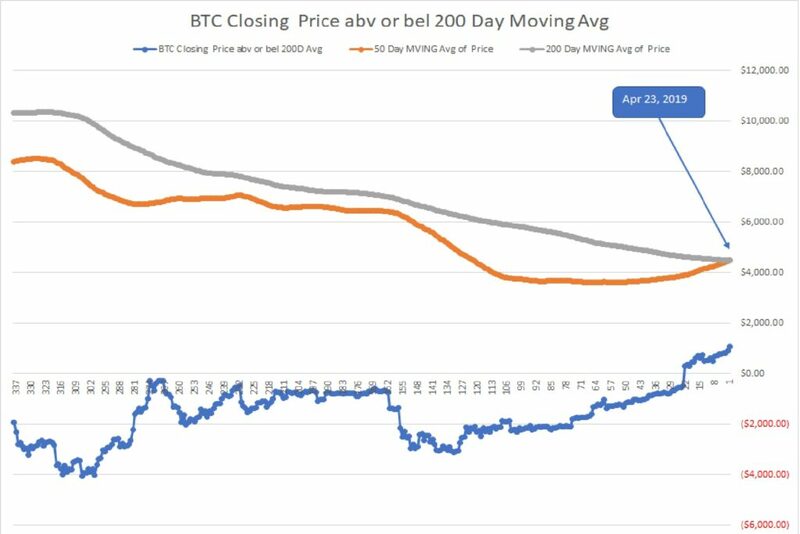 Of particular note in this phase of price discovery is the current price trend vs the 200 Day Moving Average of price, and the pattern of the 50 Day MVA vs the 200 Day MVA. As you can see with LTC, the current price went above the 200 Day MVA back on February 18, 2019. 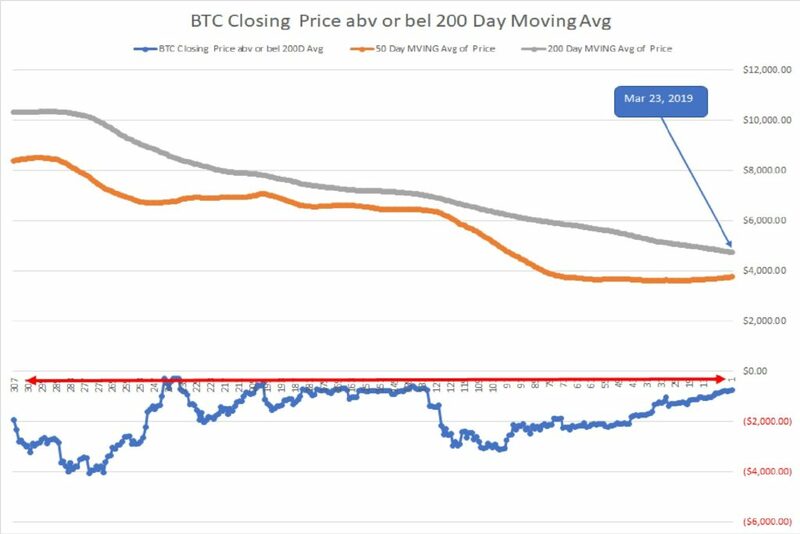 This presaged a confirming move of the 50 Day MVA exceeding the 200 Day MVA on March 16, 2019. The underlying environment of gradual and steady price increases is not confined to LTC as the other charts show. 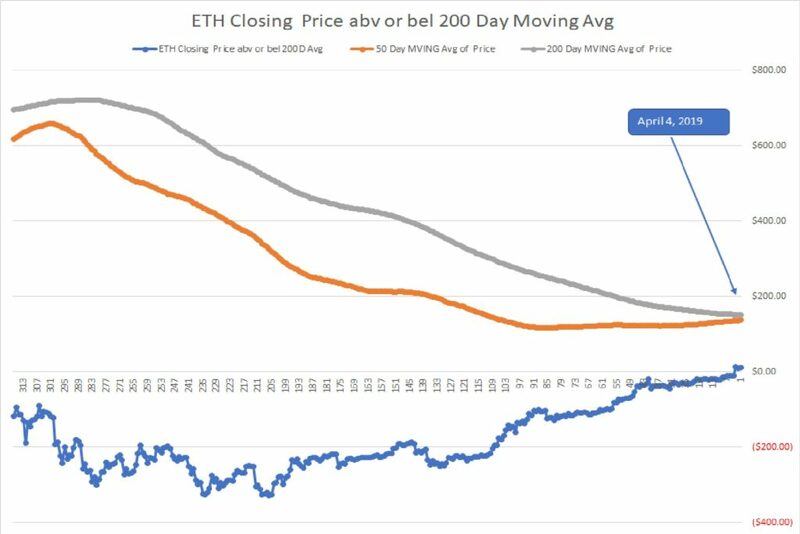 Should ETH and BTC continue on their gradual and steady price increases that lead to current prices above the 200 Day MVA (ETH is very close to this cross-over point), further accumulation at higher prices would seem likely. I highly recommend that these business platforms be researched to assess whether they fit within your own personal view of the future. I am happy to respond to any direct questions from readers as to why I view any of the above as My Favorite Ideas. I highly recommend that these business platforms be researched to assess whether they fit within your own personal view of the future. I am happy to respond to any direct questions from readers as to why I view any of the above as My Favorite Builders. I highly recommend that these business platforms be researched to assess whether they fit within your own personal view of the future. I am happy to respond to any direct questions from readers as to why I view any of the above as being worthy of further research and understanding. This document does not serve as a recommendation of any specific asset or as an advertisement. This document represents an update on events underlying the crypto-environment, with links to websites of various companies and to relevant media announcements. The writing below has been sanitized to enable publication for education purposes only. The past month has shown strong industry announcements such as new Mobile phones from HTC (the EXODUS), and Samsung (the S10), that are Blockchain enabled with Crypto wallets and connected trading platforms. A few Crypto-assets have more than doubled in value, such as Binance and ENJIN. 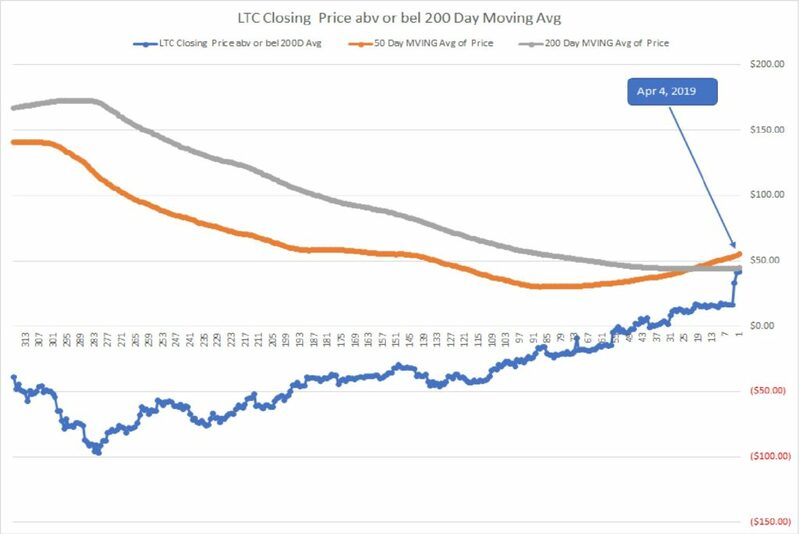 LiteCoin has increased by +20% and has now crossed over its 200 Day Moving Average. There are clear signs of positive momentum and greater consumer adoption. 2018 was a year of investment and building out platforms for the future, and the early days of 2019 are revealing broader successes from those investment efforts. The acceleration of Blockchain technology into all industries is happening, and the ability to transfer value (effectively money) within the BlockChain eco-system on a global scale is being recognized as a critical component of cross-border commerce. This is one of the most exciting times because it is not about the price of Bitcoin, it is about the adoption of technology and being alive as this evolution accelerates. We are witnesses to one of the great leaps in finance, industry, commerce, and the next generation of the power of the internet. Perseverance is what Roosevelt praised, even in the face of pain and loss, for it is the power of belief, of not giving in to those that doubt the ultimate victory, that brings change that is good and which advances society to a new platform of connectivity, of borderless sharing of ideas, of equality and the recognition that every person has something to contribute that is valuable to our world. Largest Crypto Exchange generating $500 million in annual profit during the 2018 Bear Market. Market value has doubled during the past month. This is the bridge between Smart Contracts and external data sources (Oracles) that provide the necessary information to validate terms of the Smart Contract have been met. China based Blockchain directed at authentication of digital assets and identities. Strong relationship with Microsoft is a clear positive. China based Blockchain that is similar to Ethereum. Smart contracts and decentralized business platform for the future smart economy on the internet. Gaming is now a key component of their platform. A Security Token platform to facilitate the securitization of assets in compliance with government regulations. If STOs take off, PolyMath should be dead center in the toolbox of this potential wave of new investment opportunities. Bakkt, which intends to leverage Microsoft cloud solutions to create an open and regulated, global ecosystem for digital assets. The new company is working with a marquee group of organizations including BCG, Microsoft, Starbucks, and others, to create an integrated platform that enables consumers and institutions to buy, sell, store and spend digital assets on a seamless global network. It has recently been revealed that Starbucks will begin accepting Crypto-currencies at their stores in connection with this investment. Interest earning deposits are expanding to include more crypto assets. Interest rates of between 3% and 7% are currently being paid for deposits of Bitcoin, Ethereum, LiteCoin, etc. Fidelity Digital Assetsis now live with its cryptocurrency custodial solution and will provide it to “a select group of eligible clients” as the firm is working towards becoming a go-to service provider for institutional investors in the world of cryptographic and blockchain-based finance. Robinhood, a mobile application that enables you to trade stocks on your phone has been given a New York license to trade crypto-assets. New York is the most stringent state in regulating trading of crypto-assets and is a model for other states, this approval opens many doors for Robinhood and crypto trading. One of the needs of the Bitcoin platform is to be able to process transactions with greater speed during times of peak demand. The Lightening network is being designed to sit on-top of the BTC Blockchain and will manage the high volumes off-chain or not within the BTC Blockchain. As Blocks of data are filled, they are re-entered into the BTC Blockchain as completed blocks subject to verification, resulting in thousands of transactions processed per second on the BTC Blockchain, targeting millions of TPS in the next generation release. Futures Contracts for future delivery of Bitcoin, that require physical delivery of Bitcoin is coming and this will drive demand for BTC ownership to ever higher levels. The Crypto asset class is one of the higher-risk sectors that one may invest in. Many leaders in the financial and regulatory world believe the sector will fail and that the activity in 2017 and 2018 represented a bubble and a bust that will not be recovered. I believe this is a short-sighted view (pun intended). The growth in capital committed to developing and expanding the Blockchain technology is validating the reach and potential of this technology. The number and talent of the brightest minds in engineering, computer science, and the financial industry that are moving ever more deeply into this sector is dramatic. The most desperate plea coming from the crypto eco-system is for more engineers and computer scientists. There is an unrelenting demand for the best and the brightest. Across the globe, Blockchain companies are holding workshops for developers in an effort to uncover the next critical discovery, the next idea that will springboard the Crypto and Blockchain sector into the mainstream. Today, there are more brilliant people investing their time and effort in the future of this technology than there has ever been. I have faith in what they are doing and recognize that our world of border driven tensions is pushing us to find solutions that diffuse the tension for the betterment of the people of the world. Trade wars represent the approaches of old thinking and old thinkers, whereas the next generation of the internet as a platform for distributed technologies that bring all of us closer together in common initiatives is our next chapter. We have a great book to write that will change the world, won’t you join us? 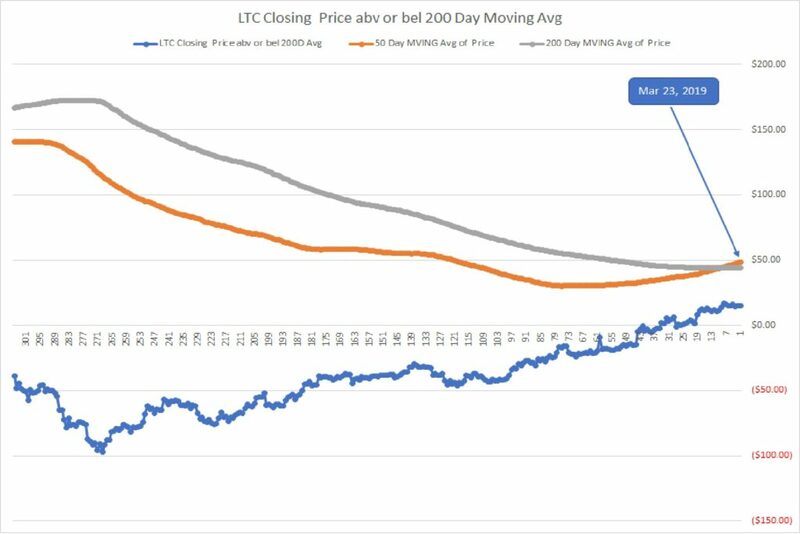 On February 18, 2019 LiteCoin’s price crossed its 200 Day Moving Average. This is often a very bullish signal for higher prices in the future. At that time, LTC was priced at $47.34. Since that date, the price has increased by roughly $10, or 20%. The chart of LTC is located within the Market Reports and Charts banner in the menu above. 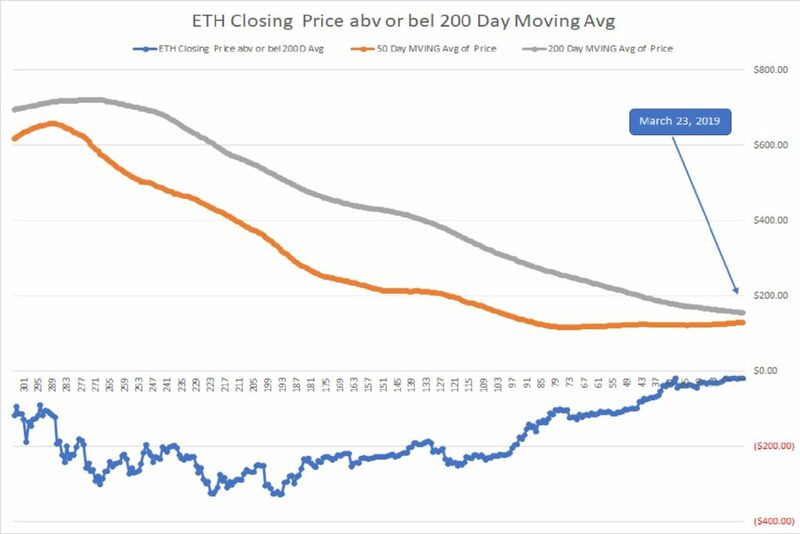 The next major crypto-currency that is approaching this notable cross of the 200 Day MVA is Ethereum. 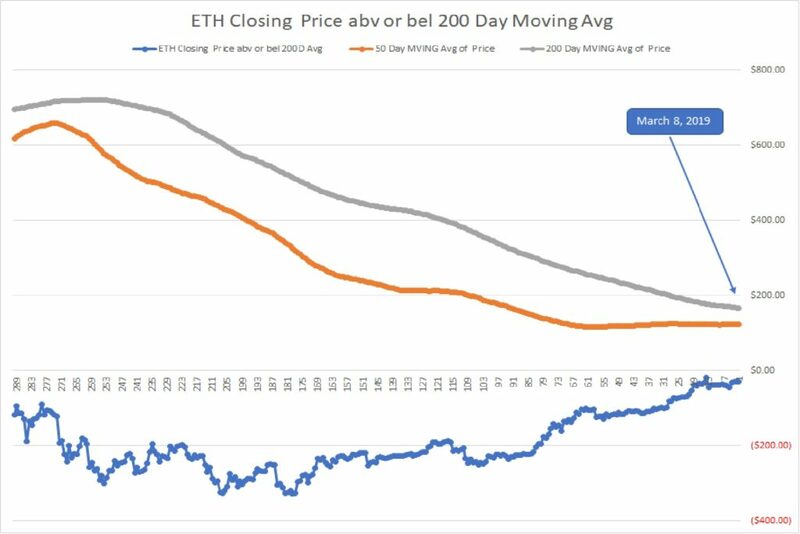 The chart below as of March 8, 2019 shows the general upturn and the closing of the gap between the 50 and 200 Day MVA, and the proximity of the daily price to the 200 Day MVA. We should pay attention to this movement in price, as ETH is only $30 below its long-term trend line. A cross would be a bullish price signal. I love imagination. Since I was a little boy I think my most precious moments have been when I let my mind wander, to imagine a world that is similar to today, but somehow different. A world that is better. It makes me happy inside to take that type of walk in a world that represents the future. For a moment I want you to join me and pause, to remember. You are between the ages of 18 and 25. Last night you were out with your mates, in a bar listening to music. You were drinking and putting money on the bar. You can still feel the beer-soaked paper money crumpled in your pocket that spent an evening on the wet wooden bar that was the platform of beers and shots, money that you sort the next morning back into smoothed out bills. Now think of a round of golf in Arizona. We are comparing cards and settling bets. Money is exchanged across the table, who has a fiver or a ten? Richard asks, “Did you give me the $400”. Now think of our children. Do you see them doing the same thing? In a world of Venmo? Karen and I ask Justin and Sydney when they are home and are heading out for a night with friends, “Do you have enough money with you”? They look at us quizzically, laugh, and say they do not need money. Everything for them is digital. What about your children? More importantly, what about you? We are used to Gary’s security of a Rubber Band, but in truth how often do each of us reach into our pocket and pay for things with paper notes or coins? Has our world become different than what it was when we were at that bar so many years ago? I think the answer is yes, and in that difference are the seeds of a world that is coming, a world that is borderless in terms of “money” flow, one that does not have exchange fees or movement that has the friction of delay. It is inevitable, and we will not need rubber bands (but you and I will still use them to our children’s delight and mockery because they reflect our time when we were young) but we will need Private Keys. •	Bitcoin trading is cumbersome and would require super computers to scale like VISA and Mastercard. •	As an investment asset, Bitcoins price has come down by roughly 80% from its peak in just under a year. The Bitcoin crash should all but exterminate the currency. The point the author seems to be making here is that there was a buying frenzy that included a mass entry into buying Bitcoin by people with little understanding of what they were doing, even by the least likely people, Grandma and Grandpa. How true is that statement? Currently, there are almost 22 million bitcoin wallets according to data compiled by Bitinfocharts.com. However, most bitcoin users have several bitcoin wallets and use multiple wallet addresses to increase their financial privacy when transacting in bitcoin. Hence, the number of bitcoin users is likely less than 22 million. A 2017 study by the Cambridge Centre for Alternative Finance suggests that “current number of unique active users of cryptocurrency wallets is estimated to be between 2.9 and 5.8 million.” It is important to note that this study focuses on active users as opposed to bitcoin “hodlers”. This gives us insight into how many individuals are actual users as opposed to only buy-and-hold investors. The Cambridge University study collected data from over 100 cryptocurrency companies in 38 countries, which is estimated to encapsulate 75 percent of the blockchain industry. Hence, we can expect the number of active users to be on the higher end of the study’s estimate or perhaps even higher. Those are relatively small numbers in a global population of over 7 billion people. While many people became aware of Bitcoin as the media focused on it in late 2017 and into 2018, the actual number who spent the time to figure out how to buy it and to commit money to it was very small. Think of us as a group, we likely have only 1% to 3% of us that own BTC. Fairly representative of the overall population in the current market of BTC (22/7,000 or 3%) and the estimated 5% of the US population that own BTC. Compare the US BTC holders to the percentage of the US population that own stocks (52%), and you can see the author’s stated frenzy for BTC has actually been very narrow. I think the author here was trying to bring emotion to drive a point home, but his point is less than factual. While there are those that get headlines by proposing that BTC will replace Fiat currencies, the truth of the matter is that this view is a minority view and not connected to the concept of BTC or the actual existence of BTC. The author has once again chosen to make an inflammatory comment that is shallow and without real substance. We would all like this to be true. However, as we know from simply watching the movement of the British pound during George Soros billion dollar move against the UK Pound or the impact of Brexit, that volatility in Fiat currencies is present. What about the EURO vs the USD? How do 50% point moves sound? In August of 2002 the EURO made its debut. It was valued at less than 1 USD. Between then and now, the EURO has soared in value to 1.58 USD and has fallen from that level to 1.05 USD. Volatility is a natural occurring event when normal supply and demand factors exist for all assets. BTC is no different. To highlight the volatility is factually accurate, but it is not a reason to demean any asset that moves based on market dynamics (think of the price of oil). Once again the author seeks to win an argument based on emotion, not facts. This comment made me laugh. I know of not one case where BTC has been counterfeited. In fact, it is impossible simply based on the structure of the Blockchain network on which it resides. This is the most foolish statement of all. I believe this is true. Just like any asset, its value is predicated on demand. I think this is an obvious fact of all assets and wonder why the author positioned it as unique to BTC? I guess he needed to meet a word count requirement to fit the paper’s column structure. This statement is both somewhat accurate and wildly wrong. Trading in BTC is fast, almost instantaneous. Try it on Coinbase. I think the author was trying to make the point that as a means of payment it has a low transaction per second metric due to the network requirements for validating the blocks that make up the BTC Blockchain. That is true. It is a young technology that continues to advance, seeking to solve the inefficiencies that it was conceived with. For example there is the Lightning Network that has been developed which is designed to sit on top of the BTC Network. It is currently in testing at 60,000 transactions per second, with the expectation that it will scale to millions of transactions per second. Even the internet use by normal everyday people went through this phase. Can you not remember the modem hooked to your computer and connected to your phone line with all the screeching and noise as it connected to the internet at incredibly slow speeds? Everything does evolve does it not? I wonder why the author would not speak to the way technology is evolving, versus concluding it is a failure when compared to VISA or Mastercard? Shallow reporting if you ask me. Oh, by the way, there is no need for a supercomputer, as the network runs on normal computers in a shared peer to peer network. Talk about sensationalism. So which is it? Is it an asset or a currency? Seems the author lost his way for a second. If an 80% price drop was enough to conclude that an asset should be exterminated, then the world would look a bit different today as Amazon would be gone for it fell by 98.7% between the year 2000 and 2001/02 (high split adjusted share price of $75.25 and a low of $5.51. Bet you wish you bought AMZN at $5.51). What about Cisco systems? Fell by 86.5%. Corning Glass works by 99%; Priceline by 99.4%; Yahoo by 96.4%, etc. You get the picture. A bank charges us for maintaining deposits with them of our own money, paying us less than 1% interest while using our money to loan to credit card users charging them 19% interest, charges us for international transfers, and delays for days sizeable deposits that are mere transfers between financial institutions. As to BTC miners, they are compensated for mining BTC which is adding new blocks to the Blockchain. They are not paid by you or me. The BTC they receive is new BTC, that is why they call it mining. There is a fee for transactions, but it is nominal and significantly less than our current banking system. For example, earlier this week, Binance, the world’s largest cryptocurrency exchange, sent $600 million with a $7 fee. To send a $1 million through a bank in an international wire transfer, it could cost institutions nearly $10,000 in fees. Taking a fee just like a bank is a partially true statement by the author, but it is misleading in substance and for me amounts to no more than a big lie buried in a small truth. Which is it? Earlier the first author posited that the price rise brought Grandma and Grandpa into the BTC market as buyers of the asset. Now writer number two says that only the possessed few will come into the market. Who is right? Are not these statements foolish? Simple fact of life, new technologies are embraced early on by the “believers”. It is not until later that the masses come on board once the technology has proven its value. I imagine you have heard of the S curve in the adoption of new technologies? We are today at the beginning of the curve. BTC has not proven its value yet in a way that would lead to mass adoption, but that in no way means it won’t. The fact of the matter is that the Blockchain is expanding rapidly into every business, and the most comprehensive and developed Blockchain at this point is the BTC Blockchain. The ease with which it enables the transference of capital from one geography to another in a seamless and timely manner indicates to me that the day is coming when mass adoption will happen, and not as a replacement of the USD, the Pound, the EURO or the YUAN, but as a compliment to them that changes the financial industry in a dramatic and significant way. What is it they say about statistics? Choosing to make a statement comparing the price of BTC to the named currencies is so misleading that I shake my head in sadness that journalism has fallen to such lows. The writer is accurate in their statement for they searched for the period in time where the statistics aligned with their theory. What if they compared the values between 2010 and now? BTC was valued at $.08 in 2010. What might the increase in value be to now at $4,000 per BTC? Lies, Damned lies, and Statistics, is what I say. Shame on these writers and the editors that allowed such biased and misleading journalism to flourish on their pages.